David Coulthard made history for Red Bull in the Monaco Grand Prix and ended his long absence from the podium by finishing third in Monte Carlo. He wore a Superman cape for his first trip to a podium since Suzuka in 2003 as part of Red Bull's promotion of Hollywood blockbuster Superman Returns. 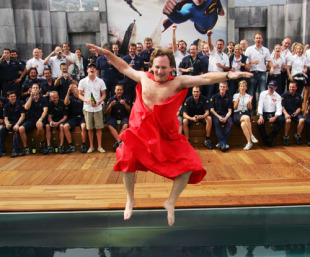 The cape was part of a bet between Coulthard and team boss Christian Horner; for his part, Horner leapt naked into a swimming pool. "I got nervous as David moved through the field but it was worth getting wet for this result," Horner grinned. Michael Schumacher won in Monaco thanks to a decision to stop only once for fuel. His nearest rival, Damon Hill, took the lead from pole but came in twice and that was the difference. "We got our strategy horribly wrong, I'm afraid," Hill said. "I'm pretty cheesed off. It has happened before and it is making it too easy for Michael. Last night, we had decided we would do one stop, but after the warm-up this morning, we changed our minds and went for two. It is a long and hard race here anyway, and when you cannot make any impression on a guy who has got more fuel on board than you have, then it seems even longer. 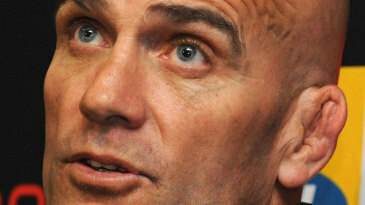 I was pretty disillusioned when I realised Michael was only doing one stop because I knew I had got a hard job on then." Ayrton Senna and Alain Prost dominated for McLaren but it was Senna's decision to run on harder tyres which helped him to victory. On a bumpy service, Prost had to stop twice on the 20th and 34 laps and was overtaken by Mansell's Ferrari before it suffered engine failure. The birth of Guy Moll in Algeria. In 1934, at the age of 23, he was signed by Enzo Ferrari and almost immediately win the Monaco Grand Prix and a month later was second to Achille Varzi in Tripoli. But in August, lying in second at Pescara, he lost control and hit a bridge. He died shortly afterwards, ranked by Ferrari as one of the best drivers he had ever seen.